This month’s SWITCH (October) is their 20th anniversary issue, and at the same time acts as a fashion issue. Coverboy Masaharu Fukuyama gets a lot of coverage inside, appearing in a few articles (fashion spreads, profiles). Fans of Chiaki Kuriyama might want to check out the issue, as she also appears in a fashion piece. 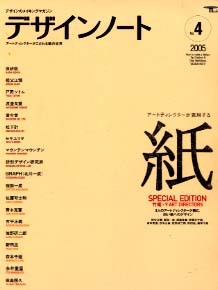 The actual concept for the issue is “No Music, No Style” (Fukuyama is a famous singer), and the magazine’s feature spotlights various musicians/bands wearing popular fashion brands. The latest issue of GIRLIE (07) is all about TV, and probably won’t be of much interest if you don’t already know anything about Japanese TV. They cover the shows that you should be watching, and the entire design/layout is that of the weekly/monthly TV guides they sell at newsstands. Kaoru Kasai is the designer featured in the latest IDEA (312), with a detailed look at her commercial work. I was actually quite surprised at the amount of famous ads/CMs she’d created — if you live in Japan, you’ve seen tons of her stuff without even knowing it. As always, the entire issue is a pleasure to leaf through, in a beautiful package (very nice paper), with bilingual text. Want to know how good the new issue of DESIGN NOTE (4) is? It made me come home and open my kanji study books, because I so want to be able to read this magazine (technically it’s a mook). The cover feature is a profile of various creative directors (including my personal favorite, Kenya Hara), with a stunning collection of works on display. Also, they cover the “Takeo Paper Show 2005,” and devote a lot of space to the idea of design through paper (with gorgeous examples). Highly recommended, even if you can’t read anything.